On first examination it would be easy to assume that the subjects of this entry in the 50 Marriage Mondays series had met through being neighbours, possibly from childhood. Only a fragment of Heneage Street exists today, and none of the buildings along the street survive. The parish of Ashted lay within the Duddeston and Nechells redevelopment area, first proposed in 1937 due to the unsanitary state of the housing. Redevelopment commenced after World War II when the area had suffered bomb damage due to its proximity to industrial targets, including St James church, which was demolished around 1956. So, can we locate the residences of Thomas and Mary Ann? A clue lies in the addresses. The abbreviation ‘Bk’ stands for back, indicating the houses 1 and 2 were situated behind the house numbered 89 that fronted onto Heneage Street. Behind the houses that lined the streets there were courts or yards serving several 2 or 3 story Back-to-Back or Tunnel-Back houses accessed by an alley or passage. Many such houses on Heneage Street had only 3 rooms. The houses of each courtyard shared outdoor toilet facilities and water pump. Birmingham Lives, The Carl Chinn Archive includes photographs of this type of housing, like Court 15 in nearby Adams Street. 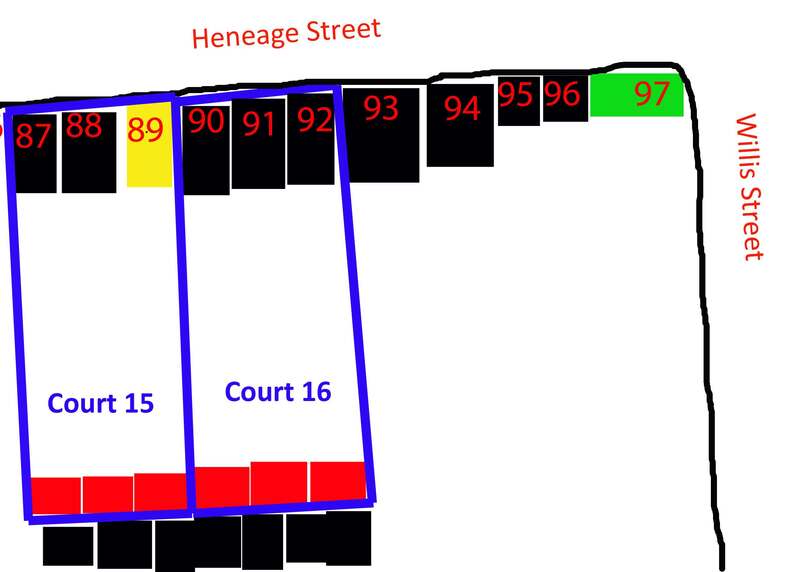 Counting back from 97, the post office (marked in green) on the corner of Heneage and Willis streets, 89 is a house (marked in yellow) with a passage on both sides leading to courts 15 and 16 (marked in blue). Each court contained 3 back-to-back houses (marked in red). The street directory does not list everyone who lived in the street, but only those prepared to pay for an entry, such as businesses. To answer the question of whether Thomas and Mary Ann met as neighbours, I turned to the 1901 census, taken a year before their marriage. Neither Mary Ann nor Thomas lived in Heneage Street in 1901. Pawn broker Dora Heybeard is enumerated at no 89 and the Bagliss, Tebbett and Browning families are listed at 1, 2 and 3 houses in court 16. Court 15 is not identified in the address column, so I am not sure which census entries relate to those houses. The most likely candidate on the 1901 for Mary Ann Barton, is a 26 year old pen grinder, enumerated as a boarder with the Kidner family at Court 23 house 1, Clifton Road, Aston. The address again gives the clue that the house was a back-to-back. I have not identified Thomas Adams on the census because there are several possible candidates. Both Mary Ann and Thomas had moved more than once prior to 1901 with their parents, but apparently left home by 1901. In 1901, Mary Ann’s parents and Thomas’ parents lived at 85 Adams Street, Aston and 5 Guthrie Street, Aston Manor respectively. It is clear that the Barton and Adams families moved around the poorer parts of Birmingham close to the city centre. They may have been even more mobile than suggested by the census records presented here. Several addresses indicate back-to-back houses. Investigating the area has helped me understand my great grandparent’s humble origins.